Speaker Boehner Gets Gavel After Pelosi's Swan Song : It's All Politics Boehner vowed more openness in the way the House operates but only to a point. Democrats wouldn't be allowed to use the new rules to block the GOP agenda. Meanwhile, Pelosi ticked off Democratic successes. 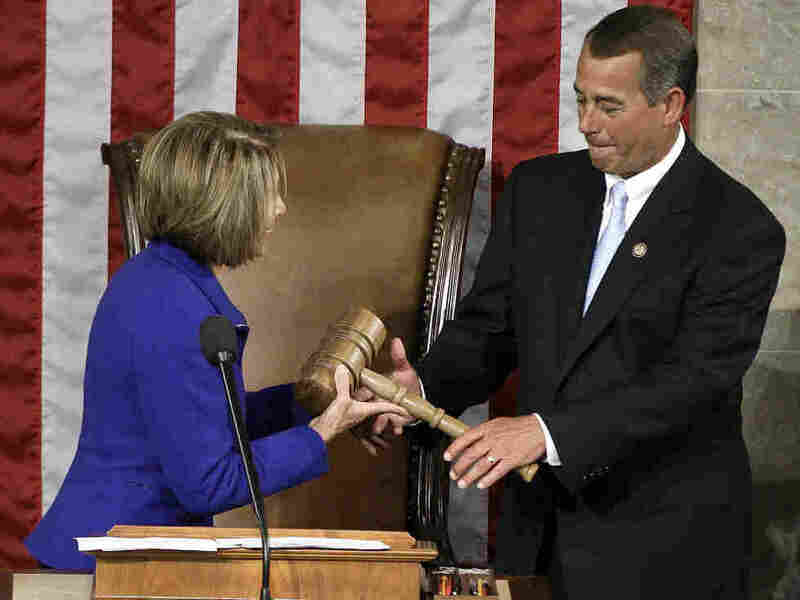 Speaker John Boehner gets the gavel from predecessor Rep. Nancy Pelosi, Wednesday, Jan. 5, 2011. Speaker John Boehner (R-OH) got the gavel of his office from his predecessor, Rep. Nancy Pelosi (D-CA) and made his first speech Wednesday in that role. In what was intended as an implicit rebuke of the way the chamber was run by Democrats and even Republicans in past Congresses, Boehner touted new rules the House would vote to adopt later Wednesday. The goal of the new procedures: to make the legislative process less opaque to lawmakers and citizens. The rules, for example, would require lawmakers to get the text of legislation that hadn't gone through the regular committee process three calendar days before a vote. And they would open the committee process. Boehner also promised to treat Democrats better than Democrats treated Republicans. For instance, he said there'd be open rules on legislation, meaning that Democrats would be able to offer amendments on legislation on the House floor. But he warned them the new Republican majority wouldn't tolerate having Democrats abuse the new open process to derail the GOP agenda. And to my friends in the minority I offer a commitment -- openness. Once the tradition of this institution but increasingly scarce in recent decades will be the new standard. There were no open rules in the House in the last Congress. In this one there will be many. And with the restored openness however comes a restored responsibility. You will not have the right to willfully disrupt the proceedings of the people's House. But you will always have the right to a robust debate in an open process that allows you to represent your constituents, to make your case, offer alternatives and be heard. In time I believe this framework will allow the House to be a place where the people's will is done. It will also I hope rebuild trust amongst us and the people we serve and in so doing provide a guidepost for those who follow us in the service of the nation. Before handing over the gavel to Boehner, Pelosi recounted the achievements of the Democratic majority, aware that it would be the last time she'd be able to do that from the speaker's rostrum. When I was first elected speaker, I called the House to order on behalf of America's children. And now, as I now prepare to hand the gavel over to Speaker Boehner, I know one thing above all else. Thanks to you, we have stood with those children and for their families for their health, their education, the safety of the air they breathe, the water they drink and the food they eat. Thanks to you, for those children and their families, we havemade the largest-ever commitment to making college more affordable enacted Wall Street reform with the greatest consumerprotections in history, and passed a strong Patient's Bill of Rights. It means that children with pre-existing conditions can -- can get care, young people can stay on their parents' policy until they're 26, pregnant women and breast and prostate cancer patients can no longer be thrown off their insurance, our seniors are paying less for their medical prescriptions. Taken together, it will save taxpayers $1.3 trillion. Thanks to you -- thanks to all of us, we advanced the defining American cause of equality for all, from the first days of the Congress with the Lilly Ledbether -- Ledbetter Fair Pay Act to the last days with the repeal of "Don't Ask, Don't Tell" policy.